Combine chicken mince with breadcrumbs, coriander, sweet chili sauce and green onion in a bowl. Season to taste and shape into patties. Heat oil in a large frying pan on medium. Cook chicken patties for 3-4 minutes each side, until golden and cooked through. Spread base of each roll with mayonnaise. 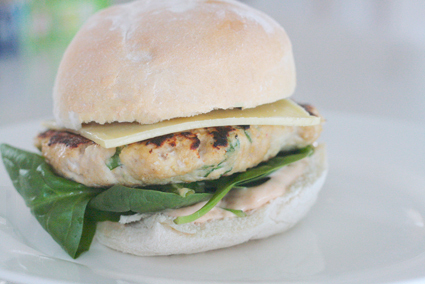 Top with spinach leaves, patties, Finish with other half of roll. (cheese if so desired)Serve. Adjust your heat level to your personal tolerance.